Peanut Butter Cocoaties - Vegans Eat What? Vegans Eat What? 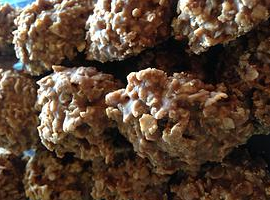 I first tasted these Cocoaties at a bake sale to benefit VegFest Colorado. After wrestling with my husband for the very last Cocoatie, I knew I had to get the recipe. Lightly spray a cookie sheet with non-stick spray and set aside. Mix the sugar, cocoa, Earth Balance and soymilk in a saucepan and bring to a boil over medium-high heat. Boil for 2 minutes, stirring frequently. Remove the pan from the heat and stir in the vanilla and peanut butter. Stir until the peanut butter has melted, then add the oats and nuts or coconut and mix well. Quickly drop the mixture by heaping teaspoonfuls onto the cookie sheet, spacing about 4 inches apart. The mixture will spread slightly. Chill just until set. Remove the Cocoaties from the refrigerator and put them in an airtight container.